Interior Designers in Kerala | Modern Style Home, Kitchen Designs. 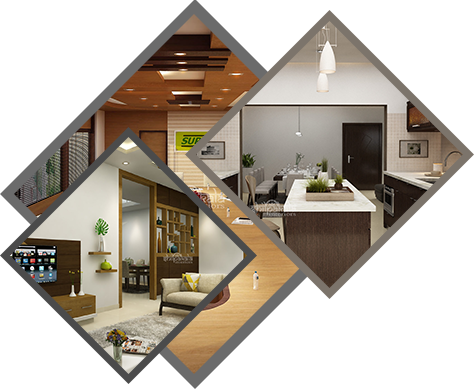 Interior designing is an art, modern technologies & diversified materials has enhanced it’s horizon. Now the creative opportunities are boundless for all kind interior designing works. Over 25 years, SHILPAKALA has been instrumental in changing trends of Interior Designing & Interior Decoration works all over the parts of Kerala. Because we believe that your home or office should be unique in the way you are! One of the key values we uphold is to understand you, before designing your home or office. Please be ready to be surprised about the suggestions from our experts. Shilpakala Interiors aims to provide professional service to its clients’ satisfaction by providing service excellence, honoring deadlines, and personalized design according to clients’ requirements. Shilpakala interiors, a professional interior design agency headed at Cochin with 2 branches. We're the leading company for both home and office interior across Kerala. We do service either in custom or packaged model and also offer turn-key projects. Since founded in 1990, we celebrated successful 25 years of experience that features our clients to gain lots of unique advantages. We made a prompted move when introduced water resistance and termite-free Kitchen cabinets as first in Kerala and pride to continue being the main promoters of the same. Shilpakala awarded the title of "best interior designer of Kerala" in the year 2010 by popular magazine in south india. Shilpakala hail from Calicut, the ancient and traditional wood joinery hub of Kerala from 1990. We professionalized higher with strong experience and set a system by 10 years of journey at 2000. In the year 2010, Shilpakala floated its operations in Cochin and accelerated the business and service strength. Moreover, due to more local requirements from Thrissur, we expanded our service by opening an operational office.